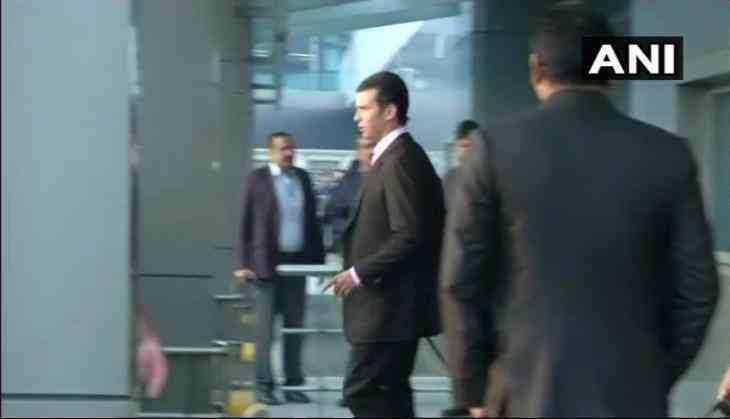 The United States President Donald Trump's son Donald Trump Jr, who is on a week-long visit to India, arrived here on Tuesday. Trump Jr. will meet with Indian investors and business leaders in Kolkata, Mumbai, Pune and Gurugram respectively, The Washington Post reported. The eldest son of Donald Trump has already advertised himself prior to his visit. Full-page advertisements in Indian newspapers on Monday invited prospective investors to buy into the Trump Organisation's project in Gurugram to join Donald Trump Jr at a dinner later this week. "Trump has arrived. Have you?" read the advertisement, inviting buyers to book their apartments in Trump Towers by Wednesday "for a conversation and dinner" with Trump Jr on Friday. An advertisement in newspapers on Sunday read, "Trump is here. Are you invited?" Trump Jr. will also deliver his maiden speech in India where he will speak on "Reshaping Indo-Pacific Ties: The New Era of Cooperation" at a global business summit on Friday. Prime Minister Narendra Modi, who will also be present, will speak at the summit on the topic of "Preparing India for the Future." In the US, some experts have pointed out the conflict of interests during Donald Trump Jr.'s India visit. "The planned speech by Trump Jr. has renewed conflict of interest concerns, with some questioning why the US President's son will be lecturing on foreign policy while simultaneously trying to hawk his family business's lavish new condominiums," The Washington Post reported. "News that the Trump Organisation would be offering buyers in the Trump Tower the chance to meet the president's son sparked criticism of potential conflict of interest, and the fact that Trump Jr. will be giving a foreign policy speech while on a private business trip complicates the matter further", The Washington Post quoted ethics expert as saying. Trump Jr. will also visit Kolkata, where the construction of a project with 137 luxury units will begin soon. Talking about his trip earlier this month, Trump Jr. said, "India is such an incredible country and our brand has enjoyed tremendous success in the region for many years. This trip is a celebration of all we have achieved, including the launch of the Trump developments in Kolkata and Delhi which have been underway for many months." According to business partners in India, many units in the Trump Towers are selling about 30 percent per square foot higher than the current market rates. Trump Jr.'s visit to India is expected to reinforce the trend. India is Trump Organisation's biggest international market, with four real estate projects underway in Mumbai, Pune, Kolkata, and Gurugram. Trump Jr.'s visit to India comes after his sister, Ivanka, visited Hyderabad in November last year to attend the Global Entrepreneurship Summit. (GES).